I have previously talked about what exactly the Gospel message is. 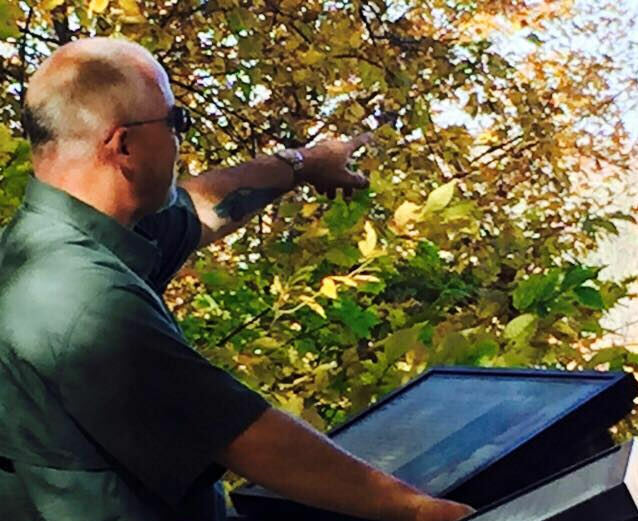 Perhaps an equally important discussion involves understanding why we should care. So let’s tackle that question right now. On the other hand, none of us would describe ourselves as being perfect, and the Bible clearly agrees: “No one is righteous—not even one.” (Romans 3:10) So being unable to claim perfection, we are left comparing ourselves to others. We say things like, “I’m not a criminal” or “I’ve never killed anyone” or “I’m not as bad as (insert notoriously bad person’s name here)”. Undoubtedly, it is easy to find others who have a worse track record than we do. Clearly we’re not as bad as some others and our good deeds outweigh our bad, so the Gospel doesn’t really apply to us, right? So, have you misused the name of the Lord? Shouldn’t we all be incredibly offended by the way the Lord’s name (and Jesus’) is used as a curse word, especially in today’s politically correct, be sensitive to others’ feelings, society? And aren’t most of us guilty of it at the same time? Be honest with yourself now! And then there is #8: “You must not steal.” (Exodus 20:15). So have you stolen something? Maybe it wasn’t a car or a TV or something of high value; but what about some office supplies from work? A few bucks from your parents’ wallet? Have you claimed all your tips on your taxes or exaggerated your deductions? If we are completely honest with ourselves about this, can’t almost all of us think of some small thing we have taken that didn’t belong to us? Have you ever told a lie? It doesn’t have to be a big one, it could be just something little. Maybe just a spicy bit of gossip you passed along or a little white lie. Big or small, a lie is a lie, but if you’re guilty of lying you’re certainly not alone, most of us have told a lie at some point in our lives. And the Bible says that all liars will have their part in the lake of fire (Revelation 21:8). As you can see, when we compare ourselves honestly against God’s law, we all fall short. And ignorance of the law is no excuse: “Even Gentiles, who do not have God’s written law, show that they know his law when they instinctively obey it, even without having heard it. They demonstrate that God’s law is written in their hearts, for their own conscience and thoughts either accuse them or tell them they are doing right.” (Romans 2:14-15) Indeed, when we are completely honest with ourselves we all have regrets, we all have things we wished we haven’t done. We all feel the guilt of our sins. “For the wages of sin is death, but the free gift of God is eternal life through Christ Jesus our Lord.” (Roman 6:23) And that is the good news of the Gospel. God made the law to show us our need for Him and He sent Jesus Christ to pay the price for our mistakes so that we can be with Him in eternity. And it gets even better than that! When we repent and place our trust in the atoning sacrifice of Jesus Christ, God fills us with the Holy Spirit to help us in the here and now. Do you understand the Gospel? That is the question that is on my heart today because there seems to be increasing confusion here in the USA about just what the Christian message is. Different churches seem to be delivering different messages these days. And how is someone going to get saved if they don’t understand the Gospel in the first place? In his first letter to the Corinthians, Paul clearly discussed using different methods, or approaches if you will, to share the Gospel message: “Even though I am a free man with no master, I have become a slave to all people to bring many to Christ. When I was with the Jews, I lived like a Jew to bring the Jews to Christ. When I was with those who follow the Jewish law, I too lived under that law. Even though I am not subject to the law, I did this so I could bring to Christ those who are under the law. When I am with the Gentiles who do not follow the Jewish law, I too live apart from that law so I can bring them to Christ. But I do not ignore the law of God; I obey the law of Christ. When I am with those who are weak, I share their weakness, for I want to bring the weak to Christ. Yes, I try to find common ground with everyone, doing everything I can to save some. I do everything to spread the Good News and share in its blessings.” (1Corinthians 9:19-23). Paul clearly used many methods and tools to share the Gospel but, while he used these different approaches, the ultimate message he delivered was always the same. In today’s culture there are many churches who use different approaches to share the same message that Paul and the other apostles preached and then there are those who seem to be delivering a different message. Indeed, there are some churches who are promising health and wealth for their followers, or promising acceptance of lifestyles the Bible clearly condemns, or promising you will have “your best life now”. To be sure, we need to be wary of anyone who says we can have “our best life now”, for the Bible is clear that heaven is so amazing that nothing on Earth can compare to it. And it is precisely because of the reality of heaven and hell that we need to have a clear understanding of the correct Gospel message – because our eternal future depends on it. And to that end, if we believe the Christian message revolves around having our best life now, then we are going to be deeply disappointed when that doesn’t happen. I can personally testify that all of the worst things that I have had to face have happened since I committed my life to Christ. I have endured many truly difficult trials, and while life today is pretty good, I know without a doubt that difficulty may come at any moment. Heaven is free of any pain, sorrow, disease, financial insecurity, or other trial and there we live in the presence of our Creator in a way that will never be realized in our life here on Earth. So while many churches and evangelists might use different methods or approaches to sharing the Gospel, which is actually very Biblical as we read above, the message being shared must be the true Gospel. And just what is the true Gospel? I can sum it up for you in a few short sentences: No matter how good we think we might be compared to others, we are all sinners (Romans 3:23). Deep down inside we all know this about ourselves, if we are honest, and the penalty for sin is death (Romans 6:23). No matter how hard we try, we cannot earn our way to heaven (Ephesians 2:9). Sin cannot be forgiven without the shedding of blood (Hebrews 9:22). So Jesus Christ died in our place so that the penalty would be paid for those who believe (Romans 3:25). And that, folks, is the Gospel message. And the salvation promised in the Gospel is available to you, right now. Simply admit that you are a sinner and repent of your sins (Matthew 4:17; Acts 3:19) and believe in, and confess, the atoning sacrifice of Jesus Christ (Romans 10:8-10). It’s that simple and you will know in your heart if you are genuine and you will feel the nearness of God in the form of the Holy Spirit (Acts 2:38). And if you have genuinely done this, please start attending a good local church where you can have fellowship with other Christians and experience the love and support of God’s family. Because the Christian life is often challenging, and living in community with other believers helps us with the burdens of life and helps us to grow in our knowledge and understanding. If you would like more information about the Gospel or how to find a church near you, drop us a line at ReignDropsBlog@gmail.com. We’d love to hear from you! The picture you see above is the tombstone of one Henry Rosen, just as I found it during my family’s annual cemetery visits. Every year some of us in my family make the rounds to the grave markers of our departed members, sharing memories and performing the simple maintenance that is required to keep the markers from fading into obscurity. Henry Rosen’s marker had no such maintenance, apparently for a very long time; being nearly fully lost to the earth when I came upon it. Curiosity got the better of me and I removed the dirt and grass from Henry’s marker. 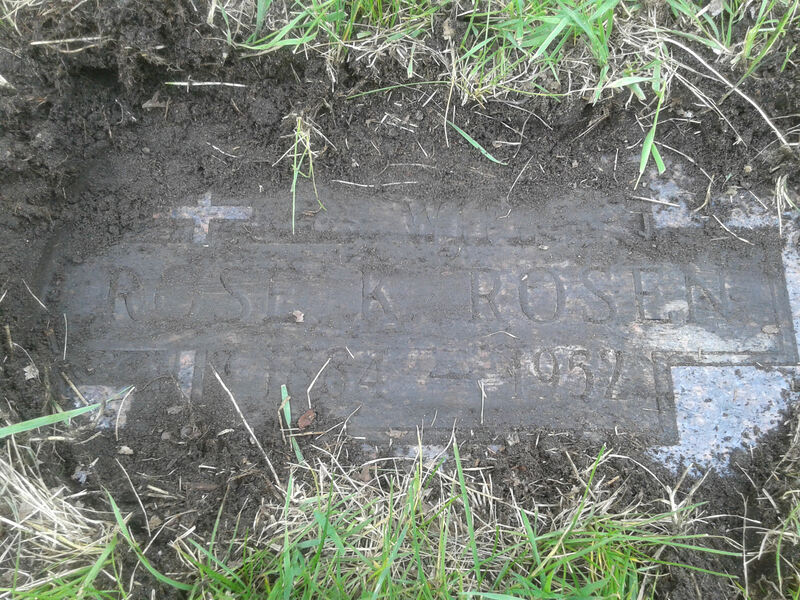 A little searching helped me discover that Henry Rosen was originally from Missouri and his parents were John Rosen, who lived a fairly short life from 1835-1876, and Susanne Demoully, who lived a much longer life from 1848-1934. Henry was born March 14, 1873, and had a first wife by the name of Mary Cihlar, about whom I could find little information other than the fact she was born in Germany. Henry and Mary had a child in 1898 named Joseph Edward Rosen. Joe was born in New Market, Minnesota, so it seems Henry chose Minnesota to raise his family. They also had a daughter named Florence, who was born in 1900 but died just a short two years later. Henry later married Rose Ellen Sebeck apparently they had no children together. Rose was born to Frank Sebeck and Rose Nerud in Cook County Illinois in 1884. How she came to meet and marry Henry remains a mystery, but she died a year before Henry, leaving him to mourn another loss. With the passing of a baby daughter, a second marriage, and the loss of Rose, it seem Henry was no stranger to tragedy. Just why Henry ended up single again and married a second time, and what became of Mary Cihlar and Joseph Edward Rosen remains a mystery to me. 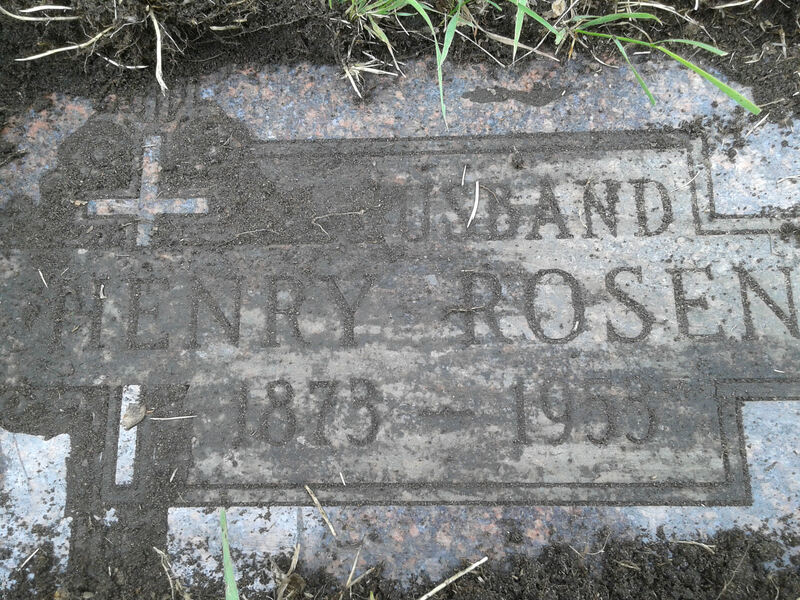 Rose is buried next to Henry and her tombstone was also on the verge of obscurity. 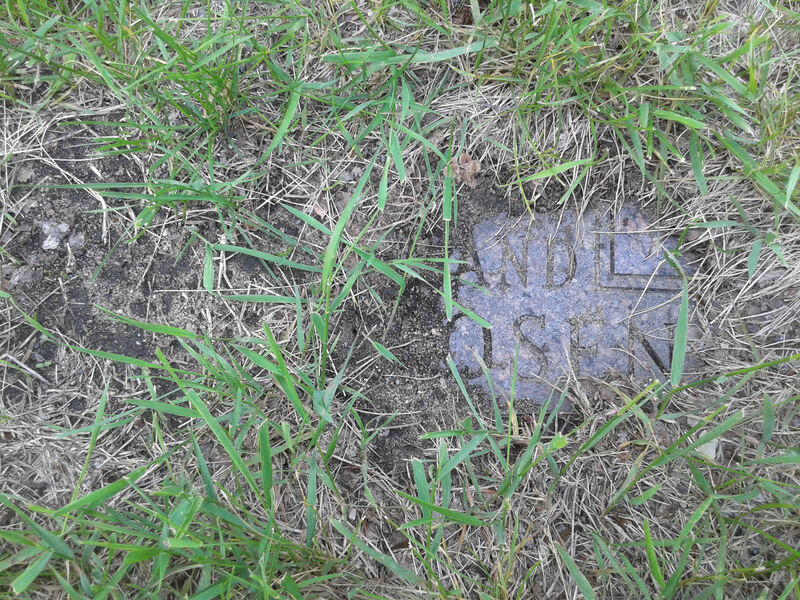 I removed some of the dirt and grass from her marker as well. So now we know a little something about Henry and Rose Rosen, and they are no longer completely forgotten though, it seems, they have long ago slipped from the minds of their own families and friends. Perhaps it’s a bit unfortunate, but isn’t that the earthly destiny awaiting most of us? Won’t we all soon be forgotten by our family and friends? I was recently asked if I knew the names of all my great grandparents and I had to admit I was at a loss to name them all from memory. How about you? Can you name all yours? How about their parents? So it would seem that within 2-3 generations after our death, assuming we have not gained notoriety for one reason or another, most of us will be all but forgotten. Indeed, all those things we were so proud of accomplishing, all those things that seemed so important to us, all our rushing about, will just slip into oblivion – our hopes and dreams decaying into dust just as our earthly bodies. So before it’s too late, before you are gone and forgotten here on earth, turn your attention to your Creator, the one who will remember you eternally. If you would like more information on how to draw near to your Creator, please email us at ReignDropsBlog@gmail.com. We’d love to hear from you!